Lakeland Village Resort is the premier condominium resort featuring hotel amenities and year-round lodging services in a resplendent mountain community. Surrounded by the heavenly slopes of Lake Tahoe with quiet and serenity not found anywhere else around the lake- yet close to all the action of South Lake Tahoe. Miles of private sandy beach- Lakeland Village Resort is a AAA 3-Diamond resort with accommodations ranging from spacious Studios for 2 to 4-Bedroom townhomes for up to 10 people. All accommodations are complete with a full kitchen- fireplace- private deck or balcony and daily maid service. Private complimentary shuttles are provided to the legendary slopes of Heavenly Mountain Resort - world-class casinos- restaurants- attractions and shopping - all minutes away. Complimentary deluxe continental breakfast daily during ski season. Complimentary indoor-outdoor parking is also available and perfect for accommodating the summer and winter conditions. The Beach House: During Summer months the Beach House on the lake offers everything from hot dogs-pizza- smoothies and sodas. The Brewery at Lake Tahoe: Located close to Heavenly and the casinos serving boutiful portions in a fun atmosphere. Open Sun-Thu 1100am-0900pm and Fri-Sat 1100am-1000pm. Riva Grill on the Lake: Lakefront dining all year round with floor-to-ceiling views serving American cuisine. Open daily 1100am-1100pm. Heidis Pancake House: Delicious pancakes and Swiss-themed breakfast. Adjacent to the resort. Open 0700am-0200pm. Lakeshore Room: Breathtaking views from the Lakeshore Room. Lakeshore Pavilion Deck: Breathtaking views from the Lakeshore Room and tented Pavilion Deck located just steps from the shore of Lake Tahoe. 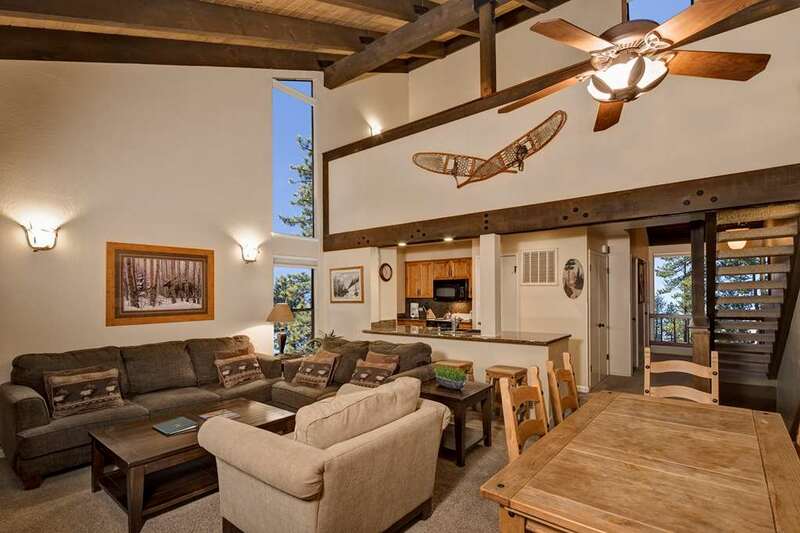 Nestled on 20 acres of scenic mountainside- surrounded by the heavenly slopes of Lake Tahoe- Lakeland Village is the premier lakefront condominium resort featuring hotel amenities and year-round lodging services. Accommodations range from Studios to 4-Bedroom townhomes with complimentary shuttle services provided to Heavenly Resort- Lake Tahoe casinos- restaurants- gondolas- attractions and shopping - all minutes away.